OUTview online; NEWS and VIEWS, What's your VIEW? 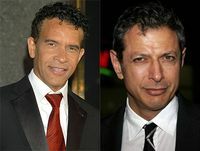 : LOVE MATCH: Jeff Goldblum and Brian Stokes Mitchell to Play Rachel's Gay Dads on 'Glee'! LOVE MATCH: Jeff Goldblum and Brian Stokes Mitchell to Play Rachel's Gay Dads on 'Glee'! Rachel Berry's (Lea Michele) dads on Glee will finally make an appearance, TVLine's Michael Ausiello reports: A show insider confirms to TVLine exclusively that onetime Law & Order: Criminal Intent detective Jeff Goldblum and Broadway veteran Brian Stokes Mitchell have been tapped to play Hiram and LeRoy Berry, the adoptive parents of Lea Michele’s character.